Having been banished from their homeland, players in Feudum must explore their new surroundings, build up their empire and increase their standing in several guilds. 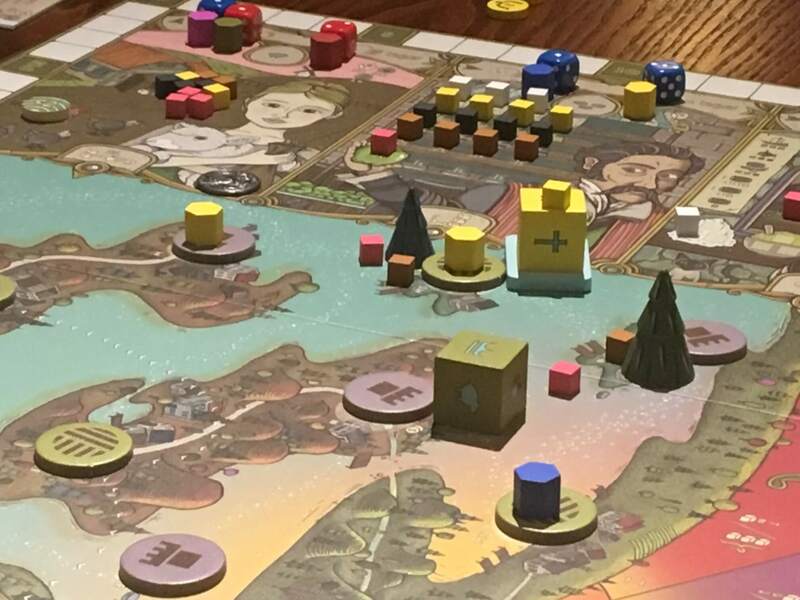 The game is an incredibly heavy euro that combines rich and individual artwork with complex, interlinking systems that create powerful possibilities. Even despite the high standard of visual appeal, Feudum’s weight makes it a daunting prospect and making the decision to dive in is a big one and it is likely to turn some players off completely. The question is, do you think it will work for you and your group? I hope that this review will help you to decide. Since the board game renaissance of the past four or five years began, I’ve noticed one consistent trend; even as game play mechanics have become more and more varied, board gaming has become more accessible to larger numbers of people. There are games nowadays that ask very little of players, but still allow them to achieve wonderful, powerful things that make them feel smart. Feudum is not that kind of game. Instead, Feudum is huge and daunting, with many, many actions available to players that will initially make even the most hardened euro veteran feel stupid. But once the players figure it out – once they understand it – it feels like a genuine achievement to make Fuedum work. I’m not personally in favor of returning en-masse to the kind of super heavy, somewhat unapproachable game that Feudum is, but at the same time, this game isn’t complex because it’s bad – it’s complex by design. Teaching it has taken me over an hour on the two occasions where I’ve had to do it and I suspect it would have taken longer had I not initially been shown how to play by another very competent and experienced player. The first game of Feudum that any player works through is likely to be a bit anticlimactic because it takes a long time to reveal its secrets. Essentially, the game can be categorised primarily as an action selection game, thanks to the fact that each player has an identical deck of cards that allows them to perform certain actions. These cards will allow guilds to be activated, pawns to be placed or moved, war to be waged and much, much more. Only four are chosen at the beginning of each round of turns, which limits the players ability to respond to the actions of their opponents. Even so, some cards have alternate or secondary actions, whilst one allows an action to be repeated. Players may also pay a certain resource to take (and play) a fifth card, although doing so must be declared at the beginning of the round. As each round is played out, players will enhance their standing with the guilds, tax the people, develop their holdings on the map, travel to distant places, farm the land, fight with one another, enact royal writs and so on, all of which contribute to the ultimate objective – scoring victory points. The player with the most victory points at the end of the final epoch (which is determined as the result of tiles drawn due to in-game milestones) will win, but deciding which method of obtaining them is best as the game ebbs and flows is much more challenging. A lot has been said about Feudum’s art style since it’s initial Kickstarter campaign and it is, without doubt, incredibly striking. Whilst I am sure that some people will probably find that the slightly cartoonish nature isn’t to their taste, the component quality and visual flair in Feudum is incredible. The board, for example, is highly individual – as are the action cards, the pawns (which are actually dice, really) and pretty much everything else in the game. Some say that Feudum prioritises style over substance, which makes the game harder to pick up and play. This theme continues with the action cards, for example, which are mostly empty (and have acres of space for the actual explanation on them) as well as several other things, but I said I’d tell you why I don’t care that much about all these issues and I will. The reason is, simply, because if you’re going to spend the time learning Feudum’s game play, then I can promise you that everything else will become reasonably well embedded in your mind after a game or two. There is kind of a trap here, which could make the occasional experienced player feel clever and accomplished in comparison to a newbie who they will inevitably beat (much like in videogaming) but I’d hazard a guess that such players are pretty rare in board gaming and you’re very unlikely to find yourself being taught to play Feudum by someone like that. I suppose I can’t offer a totally free pass here – for a game as complex and huge as Feudum to also compound the misery of new players with very complex, hard to decipher artwork is a bit unfair, but it’s also another thing to enjoy immensely if you do persevere. 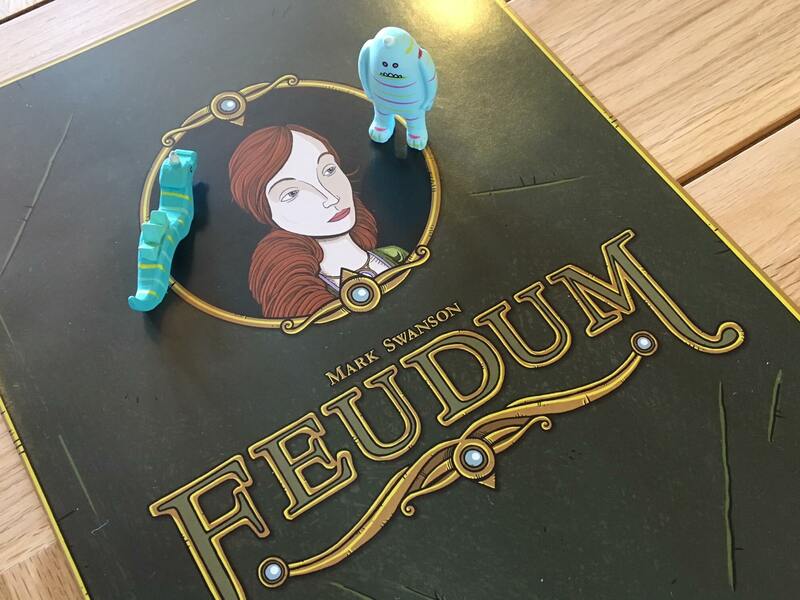 The artwork is not the only amazing thing about the way Feudum is put together – the pawn dice and the monster figures (especially the monster figures) and more or less everything else is produced to an incredible standard. To shorten this whole section, if I were to rate this game based only on how it looks and how it is made, it would be an immediate ten. Style over substance? I don’t think so, but form over function? Maybe. If I choose to avoid delving into some of the low level detail that turns in Feudum can entail (which I will,) then actual game turns could be considered quite simple. As I mentioned earlier, each player has access to a deck of eleven action cards, from which four (or sometimes five) will be chosen at the beginning of each game round. Players then take turns to play one of their action cards at a time. Play moves around the table in this way until all action cards are used. After all of the actions are completed, the players must then nourish any pawns on the table. This is achieved by paying one food cube for each pawn. If a player can’t pay, the pawn must be removed. It is possible to use one of the specific resource types to buy wine, which can nourish a single pawn for two turns, albeit at the cost of that pawn being drunk – which means that they cannot attack or defend. Next a progress die is rolled, which can result in the advancement of the epoch, which in turn results in scoring and sometimes, the replenishment of different parts of the board. At the end of the final epoch, a final scoring takes place, whereas on all other occasions, the card selection and action round begins again. As I said, all of this sounds very simple, but at the risk of allowing my Turn Structure section to bleed into the Game Experience one, it’s not. It’s not simple at all and that is mainly because of the Guild action, which is in itself made up of eighteen different possible actions. 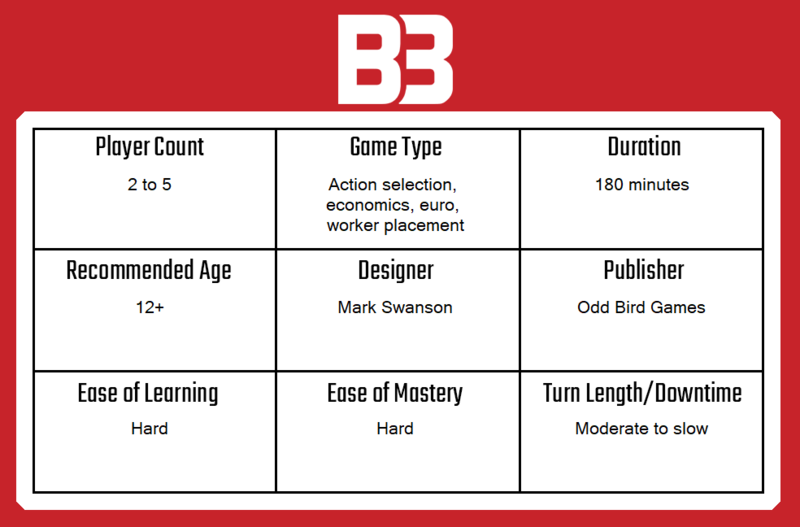 Each guild has both Guild Master and Journeyman levels of influence (gained through pawn placement, influence over different structures in the world and so on) as well as a basic trade action. The Guild Master and the Journeyman are each able to push or pull from the guild in question, which moves resources, gunpowder and other things around the board (infamously including the ability to put rosary beads on chickens) in order to score in different ways. The trade action can be accessed by any player at any guild (even without any influence in that guild) in order for them to advance their board, but it does not enable scoring. There are certainly other things to note about turns in Feudum, but being perfectly fair, they are quite normal. Attacking, defending, placing pawns on the board – all of these actions are fairly normal. Even improving locations (which involves spending appropriate resources to upgrade towers to farms, to cities and then to Feudums) is as simple as it sounds. 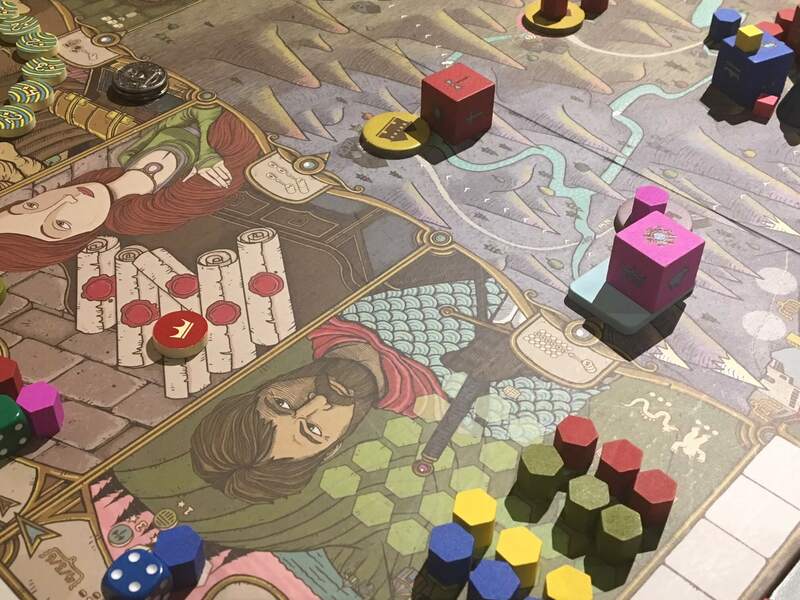 Influencing locations is perhaps a little unusual in that each location can support up to three influence tokens but only from two players at once, which ensures that only one player can be the “Lord” and the other the “Serf.” Advancing Epoch can be fiddly and hard to remember, but to be fair, the player aid is very clear on how it’s done – it’s just easy to forget. And so, a successful strategy in Feudum might involve tending the land, claiming influence in some quiet corner and running the Farmers Guild to maximum efficiency. 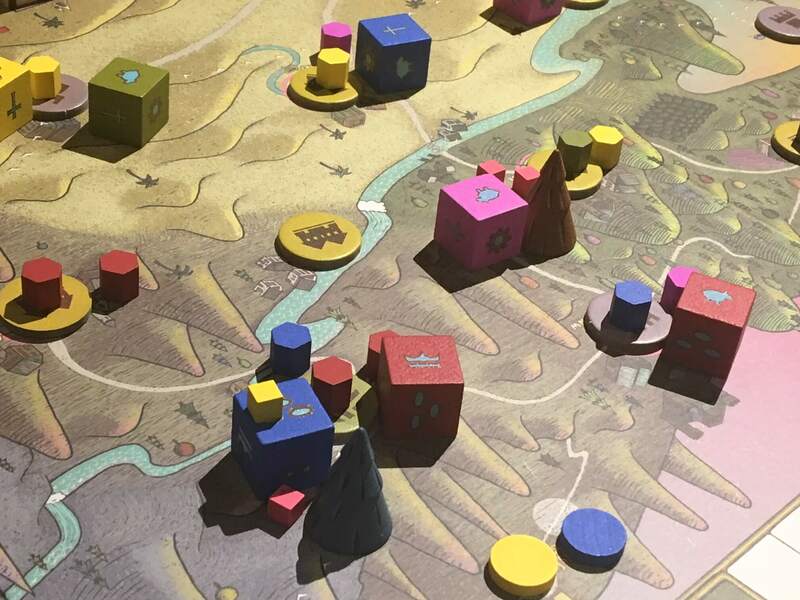 It might also involve attacking other players often in order to build up a military presence which, I must add, is absolutely necessary if you intend to build Feudum’s – because if you don’t attack other players, the king will tax you in victory points. It’s also possible to focus on working a couple of guilds (although you’ll need a board presence to remain relevant) or to snap up several Royal Writ’s and scoring them. There are relatively few short term strategies in the game, although sneaking into a powerful guild and pushing or pulling it with no long term desire to stay there can be a thing, especially when it costs your opposition time and resources to remove you again. The strategies on offer, in line with the thematic elements of the game play (and even some of the language) come together to present a kind of medieval life simulator. It’s kind of grim and odd at times, but Feudum also feels reasonably tongue in cheek, which at least fits the visual style better than the heavy weight game play does. I’ve made a big deal about Feudum’s weight because it is a very lengthy teach (probably over an hour) and requires a huge mental overhead for players to accommodate, but I think something like half of that weighty feel (if not more) can be attributed entirely to the way that guilds work and (to a slightly lesser extent) the amount of visual complexity on the board. On both notes, I will say that the game does come with a set of excellent player aids that explain every card, every guild action, the turn structure and several other helpful things. These are absolutely perfect for reminding a player that has been taught properly, but be warned – this isn’t a game that you should attempt to learn and teach at the same time. Outside the guilds, the fact that all action cards are chosen simultaneously at the beginning of a round can also result in missing out on what you want to do, though I don’t believe it often leaves a player completely unable to act – it more forces them to act sub-optimally. This is either a good thing or a bad thing, depending on your perspective. Personally, I think it’s an intention feature of the game that works to keep players thinking flexibly, although I would have liked to see a few more alternative or secondary actions to ensure that no turn is a real washout. Love it or hate it (or even if you feel something in-between the two) then Feudum is nothing if not thought provoking at the very least. It’s a beautiful looking, exceptionally well made game that really allows players to build a slightly silly fantasy kingdom, complete with serfs, knights, castles and the rest. The weight of the game hardens the lightness of the artwork somewhat, but it also delivers a complex and rewarding decision tree that requires foresight, long term strategy and mental agility. Feudum can be a real slog to teach and you might even lose a few potential players before the game even begins, but personally I do think it’s worth the effort to persevere, push through the initially intimidating rules and see what adventures await. 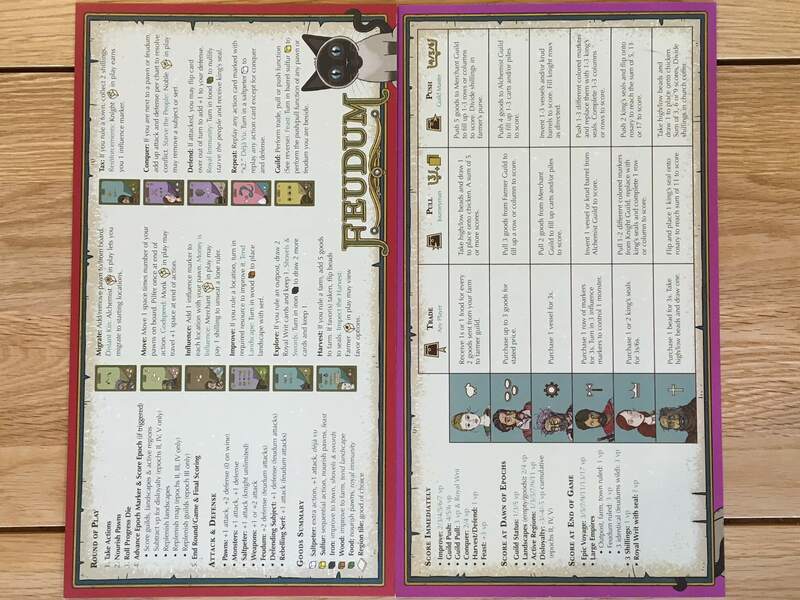 A copy of Feudum was provided for review purposes. You can find out more about Feudum on the website of publisher Odd Bird Games.